Even MORE flats have been added to the Project Flats Map in the last couple of days. I’m on a mission to get this map up to date. To me the most important thing is that I can visually represent all of the named student flats in Dunedin overtime, those I’ve either seen and documented myself, that I have read about in memoirs, or have been reported in various means. I built this map on 12 March 2009, back when playing with Google Maps was reasonably new and novel. It’s been viewed over 11,800 times since then. After some initial confused forays into the new Google Maps that was released this year, I’ve reverted back to the original version which seems to work the way I want it to, which is to map address, add detail to that record, and then display the embedded map in this blog. Google Maps does not list addresses either numerically or alphabetically, and I have ascertained no way of being able to do this. 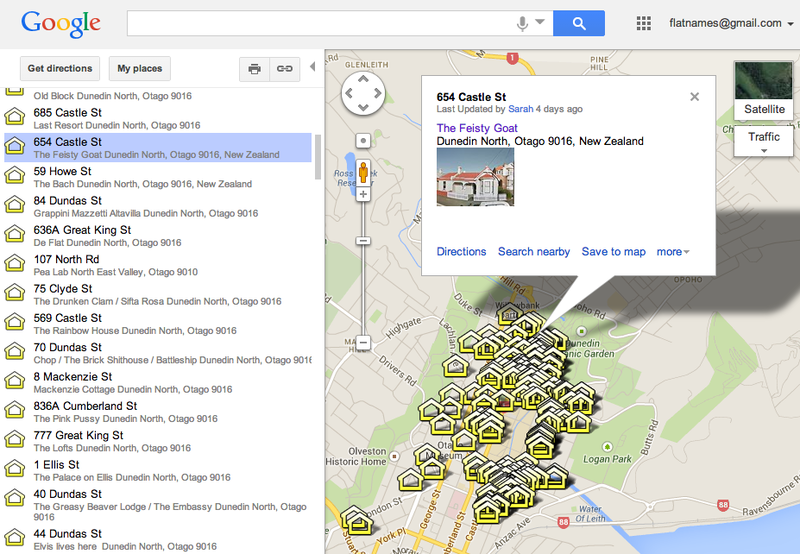 So the easiest way to find your address is to open the Dunedin Flat Names Map, do a find search (command F – rather than use the search box) and type in the address details. Here’s an example: 654 Castle Street. Click on the address which should be highlighted in the list on the left, and up will pop the details (on the right) with a flat name and, hopefully, a photo. If the flat name has a clickable link, this will take you to a Dunedin Flat Names Project Flickr or Facebook page where you can make a comment or view some more information about the flat. Google Map showing a FInd (command+F) Search for 654 Castle Street. Note the name of the flat is clickable.